Our expert developers can convert your Photoshop documents into high-quality HTML codes for performance-oriented web pages. We have a team of dedicated coders that strictly believe in the manual coding of markups for the clients’ PSDs. The HTML codes we curate have the desired elements to add to its responsiveness and make the pages perform on any device. Our developers are also experienced in creating email templates as per the designs that our clients provide. The developers at our company keep a tab on the latest HTML web standards in the website development & designing industry. We include SASS compatibility with the HTML markups we create to ensure unmatched features for your web pages. Our professionals convert your PSD into responsive codes to ensure that they flawlessly perform on any screen size. Our designs are integrated with the latest web standards to ensure your web pages perform well on the web. Fiorella Shoes Ltd. has been leading the Footwear industry in London (UK), since 1975 with a Footwear collection to die for. The assortment of our Footwear encompasses Boots (Short), Heels, Flat Shoes / Jellies, Trainers, etc. This collection is especially designed by keeping in mind the demands of fashion-conscious people. Also, the company offers several discounts and deals to the customers in order to achieve full customer satisfaction. We have undertaken the task of SEO promotion of this company via website development, using modern web designing tools. Midland Services Limited was established in the year 1985. It is a Delhi Stock Exchange Listed public limited company. Its business activities include Supply Chain Partnering with existing commodity dealers and trading of the frozen processed food products. Additionally, the company is functioning as Commission Agent for Fresh Fruits and Vegetables (FFV). 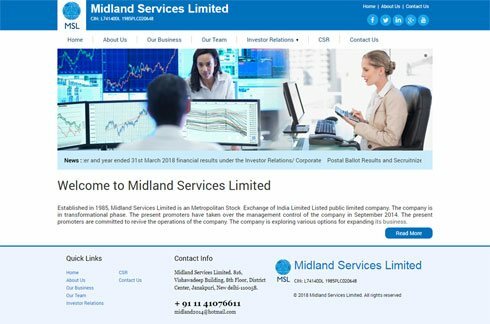 WeblinkIndia.Net has designed and developed the website for Midland Services Limited. WeblinkIndia.Net is well known for offering services such as Website Designing, Website Hosting and Web Development. HelpMeSammy is a renowned name in the online marketplace, operating as a single window solution provider for a variety of insurance requirements. With our services, we assist clients in making informed decisions by comparing different insurance schemes offered by the top providers. The range of our services entails life insurance, health insurance, motor insurance, general insurance, group mediclaim cover, corporate insurance, travel insurance, home insurance, personal accident, cancer insurance, etc. So, get registered with HelpMeSammy and avail the benefits of simplified solutions. Our company website is designed and marketed by WeblinkIndia.Net Pvt. Ltd.
Other than Exporters India, WeblinkIndia.Net owns and handles Indian Yellow Pages. It is also one of the most browsed Business to Business Online Directories of India. 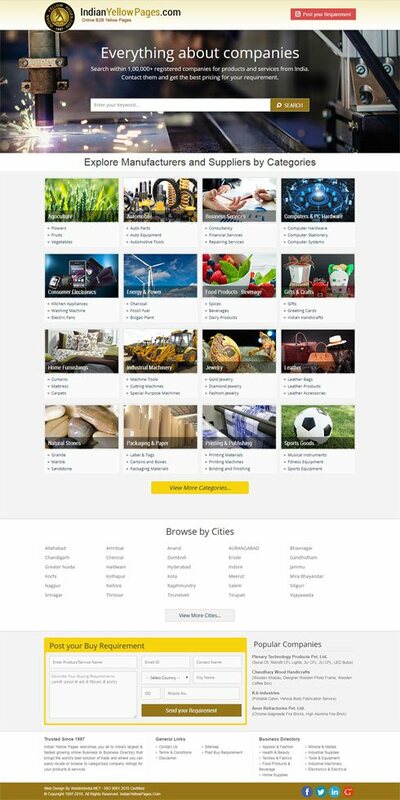 Here, Manufacturers, Exporters and Suppliers from all over the world can list their products & services. As the portal is browsed by numerous buyers, entrepreneurs receive genuine business enquiries. By creating such useful portal, WeblinkIndia.Net has actually helped a number of traders and buyers alike. WeblinkIndia.Net has expertise in Static Web Designing, PHP Web Development and Linux Hosting. Our latest hand-coded web pages allow access to the visitors from all browsers like Safari, Internet Explorer, Google Chrome, Mozilla Firefox etc., by instantly launching the pages. Semantic markup and coding not only ensures that the HTML codes are search-engine friendly but also allow the scope for any customization in the future. Web pages with HTML coding have an efficient content management system integrated within to allow easy management of the content going live on the site. In the current scenario, where visitors tend to leave a site that does not load within 3 seconds, HTML conversion of PSDs ensures faster loading of web pages to make the visitor stay. Why WeblinkIndia.Net For PSD to HTML Services? Today’s online users do not wait for any site to load. The HTML5, jQuery, or CSS3 pages we convert have well-categorized structures that ensure quick & smooth navigation while cutting down on load time. While converting the PSD to HTML5, CSS3, and jQuery, our programmers ensure that all the standard norms mentioned in W3C consortium are followed. The hand-coded web pages are all W3C complaint for higher ranking. Any irrelevant codes are removed while converting the PSD to HTML to ensure that the markup is fully optimized. This also enhances the performance of your website.